The Dow Jones Industrial Average crossed the 17,000 mark for the first time this year. What does it mean? The market is somewhere in the Excitement stage of the Overstone cycle of trade. 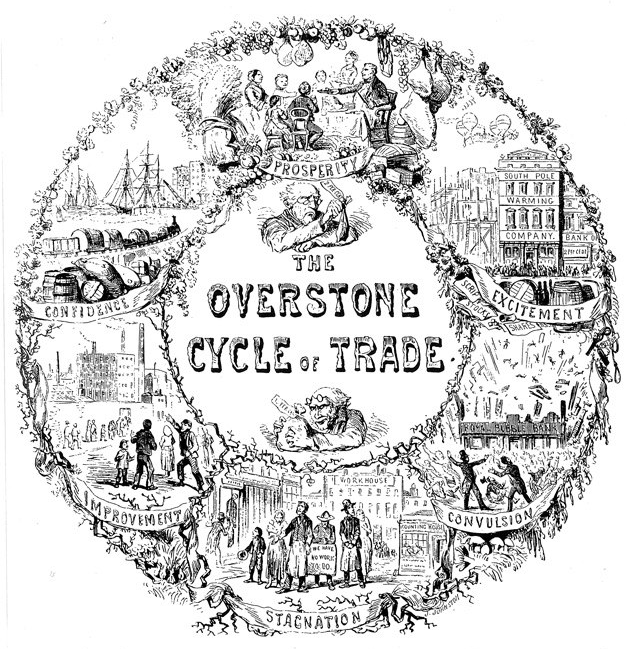 Overstone described business cycles in the mid-19th century. Starting at the six o’clock position in the graphic, the cycle begins with Stagnation, the depths of the depression with high unemployment. Stage two is Improvement, followed by Confidence, then Prosperity, Excitement, and last, Convulsion. If you enlarge the graphic you’ll notice Overstone’s sense of humor. In the Excitement phase, crowds fight to get into the building with the sign “South Pole Warming Company” while a machine lifted by four hot air balloons flies over the building. In the Convulsion stage the Royal Bubble Bank explodes and sends people flying. 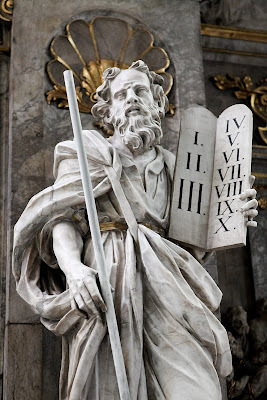 George Soros describes the Excitement stage as one in which the stock market becomes disconnected from the real economy, but Soros is thinking like a mainstream economist and assumes that the market has an intrinsic value somewhere close to the net present value. In reality, investors are merely adjusting their risk tolerance for the prevailing interest rates and opportunity costs. With ridiculously low interest rates, investors are showing greater tolerance for risk and a thirst for yield. One of the main drivers of stock prices is the changing discount rate of investors. What that means is that PE ratios may continue to rise and there is no way of knowing how far. But investors will have to come back to ground when profits start to fail. We are entering the profit reporting season for the third quarter and it may give us market direction. So when the market crashes as it did in 2000 or 2008, their wealth gets caught in the whirlpool and gets flushed. Not only do investors need patience, but we need to be willing to be wrong as Spitznagel wrote in The Dao of Investing. Investors who followed his MS Index might have exited the market last year and missed the latest run ups to record highs. Friends and family would be mocking them and they might suffer from regret. But if they stick with the index they will earn more in dollars over time by avoiding the major collapse that is coming, even if it is another year away. As Spitznagel wrote, it's counterintuitive, like many of the teachings of the Dao. Many advisers can find good value stocks when the market is high, but keep in mind what Benjamin Graham wrote about buying unloved stocks when the market is high. Investors won't love those stocks more when the market collapses. They will drop with the crowd.